A 2005 TEC Award Nominee. The Millennia HV-3D is a 4-channel, fully matched microphone preamplifier of uncompromising sonic character, technical specification, and mechanical workmanship. 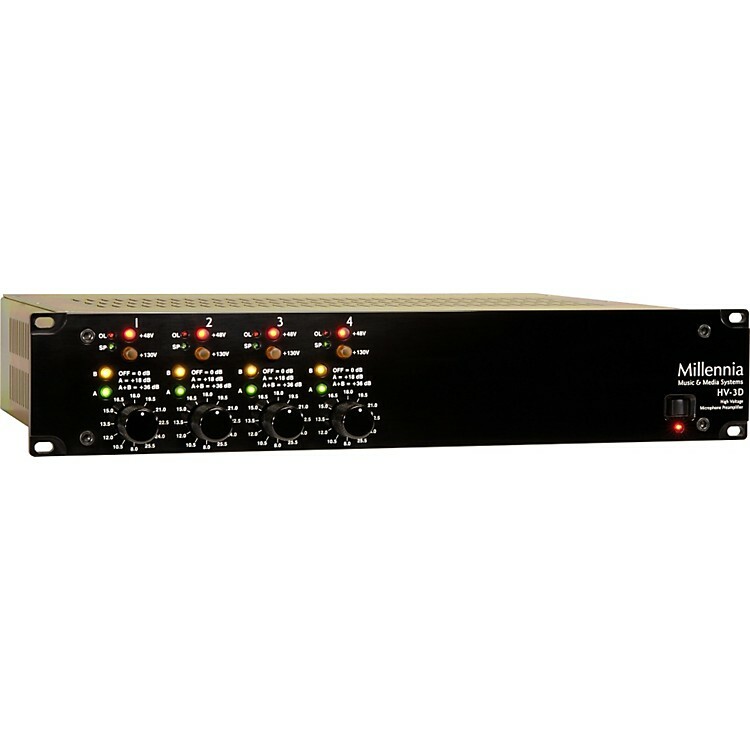 It offers 4 double-balanced, extremely wide dynamic range stereo microphone preamplifiers intended for demanding acoustic recording. It combines precisely matched, discrete bipolar transistors with a laser trimmed DC coupled FET-based output driver stage. Unlike standard mic preamplifiers, the HV-3D-4 never unbalances or rebalances the original signal, thus maintaining the highest degree of signal integrity. Unlike preamps using vacuum tubes, IC function modules, and audio transformers (all of which can lend their own audio coloration) the Millennia HV-3D is precisely optimized to capture the subtlest detail of the music and ambience. With +23 dBu native input headroom, it requires no input pads, attenuators, or switch points as found on common textbook preamp designs - thus avoiding yet another source of sonic degradation. Moreover, with its +32 dBu output headroom, ultra-high dynamic stability and linearity is assured.